"The Mindful Bus is genius in its simplicity and depth. As a newbie to Acceptance and Commitment Therapy, I felt like I received a comprehensive overview. Best of all, by the end of the game I had a values-driven action list and was ready to take steps towards a personal goal, armed with mindfulness-based tools to combat the mental traps that befall us all." 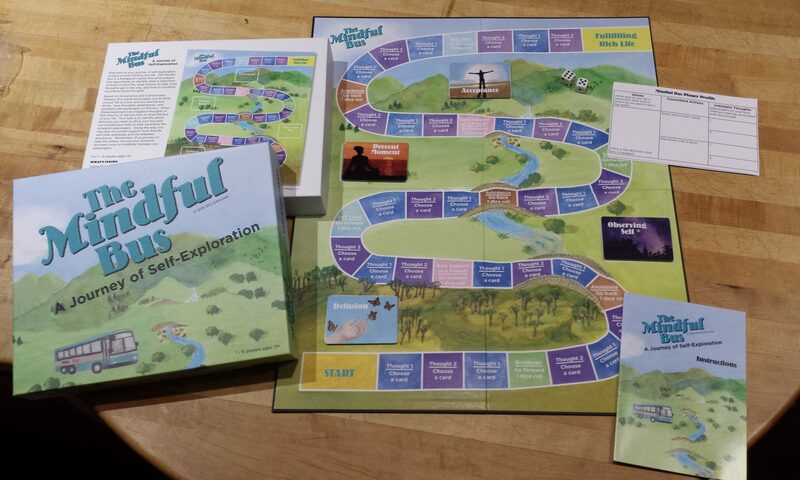 "The Mindful Bus is an intelligent and playful game that is beautifully designed. The cards skillfully taught me a balance between openness and awareness of unhelpful thoughts. Playing the game has helped me better live in harmony with my heartfelt values." "I used Dr. Edmunds' Mindful Bus game at one of the treatment centers where I work. The clients really liked it. The game helped as a catalyst to discuss feelings at a deeper level than I expected. I highly recommend getting the game!"